Note: This is the second in a series of blogs about the functionality and potential of custom end user apps for nontechnical owners or managers of commercial buildings. In my last blog, I wrote about how a single mobile app with multiple functions and a consistent brand, look and feel can differentiate and add value in highly competitive service-oriented businesses like hotels, hospitals or even apartment complexes. Which brings me to the next topic for those who are building experts and not mobile technology experts: how exactly does all the data and services for commercial buildings get aggregated and delivered via a mobile app? Building experts know how to make a best-in-class building experience. You keep them cool in the summer and warm in the winter, and ensure they provide adequate lighting, good air quality and a sense of security. But today’s responsibilities go far beyond that. Your job includes simplifying and adding value with services to create occupant satisfaction. That’s because comfortable employees are more productive, and productivity means an improved bottom line, which is vital to maintaining building value for all stakeholders. Face it, today’s buildings and your jobs are complex! Those with skills to aggregate connected devices into a single mobile app are truly pioneers in the emerging world of IoT! As discussed previously, mobile app technology has become essential to simplify our world. 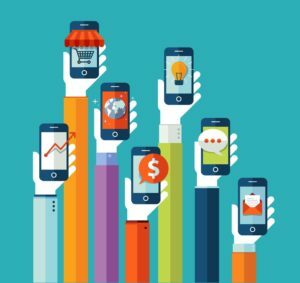 Indeed, mobile technology is recognized as the catalyst to transform businesses. Now we have them to manage and maximize the occupant experience in buildings. But the skills required to master a building environment are very different from mobile app development expertise, and it’s not easy to find a technician comfortable in building management systems and mobile application design. Why? Designing an easy-to-use and appealing app requires specific skills, but the technical ability to monitor and control various building equipment from a single app is an additional challenge, requiring a completely different level of expertise. While mobile development targets two main platforms (iOS and Android), the world of connected devices today is not that consistent. Each smart device comes with its own communication and operation mode, depending on its manufacturer. It is easy to find an expert iOS or Android app developer, but someone with the skills and knowledge to aggregate various connected devices into a single app is truly considered a pioneer in the emerging world of IoT! The point to all this? We need to make apps that are relevant and easy to create, distribute, use and maintain. Watch this video on the AdaptiApps custom end-user app development kit to see how it’s possible. Designing – The process starts using pre-engineering widgets in a cloud environment. Here building experts can design customized, consistent, secure and aesthetic apps able to control and monitor buildings environment. Apps run on the most popular mobile and fixed devices, and are platform-agnostic (including iOS, Android, Windows and Mac OS). All aspects of coding and device operating system compatibility are taken into account behind the scenes, allowing building experts to remain 100% focused on providing the best customer experience. Pairing – While the app design can be done at the early stage of a project, deployment and pairing with connected devices and services are defined once during commissioning. Effective pairing is done on-the-fly while the app is deployed. Each user will get a ready-to-use customized app connected to their environment and linked to the needs while in the building. Deployment – Options for deploying customized apps are flexible depending on the different types of user profiles, such as resident, visitors, patient, etc. App deployment is fully managed by the property manager who decides which apps will be deployed and to whom based on occupants’ roles and needs. Then the customized app can be obtained on request by scanning a QR-code from a smartphone, or it can be delivered to the occupant via email. Maintenance – As design and deployment are done from a central location, updating apps is a straight forward process. The property manager decides in few clicks to deploy, remove or update apps remotely, without any user action required. It ensures building occupants of the best user experience, giving them access to latest available building resources. There are affordable solutions that accommodate the complexity or versatility of today’s commercial buildings. In the next blog, we’ll discuss what goes into app selection and development, and why it not as simple as it looks! In the meantime, read about adaptable mobile apps for healthcare facilities in this blog series.